Andre and I are staying at L'Oase Hotel and Racquetball Club in Costambar, just a few miles from Puerto Plata on the north coast of Dominican Republic. We've stayed here several times before, with hosts Joseph, Vashti and her teenage sons. 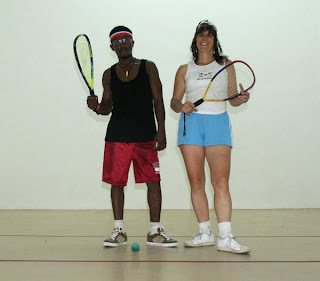 We always have a good time and play lots of racquetball. I wanted to go to Samaná for a few days. It's about 3 hours from here and we've never been, but Andre prefers to stay here until just before I go back to California on May 5. He has a flight reservation for May 6, but we still don't know if he'll have his visa yet. A couple of days ago we were walking back from Jenny's Market and a light-skinned Latino guy in a nice car pulled up beside us, just outside the hotel entrance. He yelled out, "I hope you guys get your visa. I've been reading your blog," in perfect English. I kind of laughed and thanked him, assuming Andre knew him. Andre stayed at L'Oase for 3 weeks in March prior to his inteview at the U.S. Consulate in Santo Domingo, but he didn't recognize the man. Later I asked Joseph and Vashti if they knew who that could be. They had no idea. So I'm hoping the "Mystery Man" is still reading our blog and will identify himself. My email is chelseamaya@gmail.com and Andre's cell phone is 809-767-5605. Andre thinks it's because we're so famous. Ha!